The molecular methods introduced in organismic systematics not only allow a better reconstruction of the phylogeny and diversification of a given group (that is the reconstruction of the successive steps of diversification = the “nodes” in the phylogenetic tree), but – in combination with fossil data – also allow conclusions on the time when these diversification events took place. The “molecular clock method” uses the mutation rate of biomolecules (such as nucleotide sequences for DNA or amino acid sequences for proteins) for calculating the time when given groups diverged from their ancestors. From the analysis of the mutation rates, the relative length of the time periods of the diversification events can be deduced (e.g. whether one time period was two- or three-times longer/shorter than another). For the assignment of concrete (absolute) time dates (e.g. 50 mya = 50 million years ago), calibration of the “molecular clock” is necessary. Calibration must be by independent evidence of time data, such as the fossil record (absolute dating by geological, radiometric or other dating methods). The information on concrete time data refers to two time events: the age of the “crown node” (most recent common ancestor of a sampled taxon of the clade of interest) and the age of the “stem node“ (most recent common ancestor of the clade of interest plus its sister clade). In reality, the “nodes” are not narrowly circumscribed time events, but the median values of ± broad time ranges. Example of crown (node) age: the blue line indicates a possible age range, e.g. (55-) 50 (-40) mya, or 55 to 40 million years ago, best estimate being 50 mya. The first to include Gesneriaceae in a molecular phylogenetic dating analysis – relating to the “Asterid flowering plants” (“Asterids” + “Euasterids” + “Lamiids”; with the latter containing the order Lamiales with Gesneriaceae) – were Bremer et al. (2004). They calculated that Gesneriaceae (in their traditional sense, that is with exclusion of Sanango) originated between 70 and 80 million years ago (stem age: 78 mya, crown age: 71 mya). More recently, a much more detailed analysis, with focus on neotropical Gesneriaceae was provided by Perret et al. (2012). 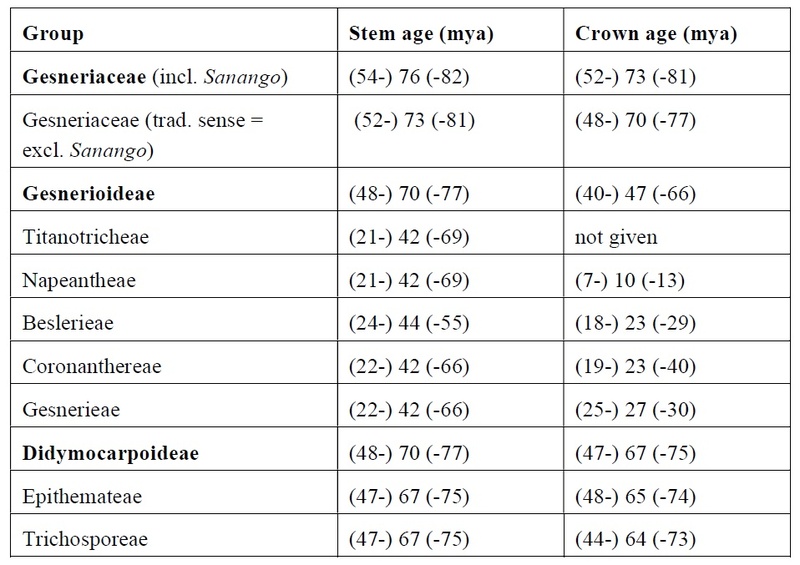 For Gesneriaceae (in their traditional sense) they suggest a late Paleocene/Eocene age, with a stem age of (45.1-) 57.5 (-68.1) and a crown age of (37.1-) 44.7 (60.5) mya. The inclusion of Sanango not only widens the morphological concept, but also influences considerably the assessment of the age of the family. It shifts the origin of the family into the Paleocene (stem age ca. 63 mya, crown age ca. 58 mya). This chart fragment from Perret et al (2013) illustrates the inferred age of some species of Gesneriaceae, in terms of millions of years. The full chart can be found in the article, available online at the link below. Hover to zoom, click to open a larger image. According to Perret et al. (2013), the split between Gesnerioideae and Didymocarpoideae was probably in the middle Eocene, with stem age of ca. 44.7 and crown age of ca. 36.2 mya. Within Gesnerioideae, the tribe Coronanthereae split off early (stem age ca. 34.3 mya), but reached its crown age only about 10 mya, in the middle Miocene. The full text of “Temporal and spatial origin of Gesneriaceae in the New World inferred from plastid DNA sequences” (Perret et al, 2013) is available online. More recent papers (Petrova et al. 2015, Roalson and Roberts 2016), however, suggest a higher age of the Gesneriaceae. The paper of Petrova et al. (2015, available online) focusses on the European Gesneriaceae, particularly Haberlea. The age of traditional Gesneriaceae (excluding Sanango) is given with (67-) 65.5 (-55) mya. The inclusion of Sanango results in an age of roughly 85 mya. Regarding the European Gesneriaceae (Didymocarpoideae-Trichosporeae-Ramondinae; comprising Ramonda, Jancaea and Haberlea), the stem age is given with ca. 33 mya and the crown age with ca. 25 mya. This means that the European Gesneriaceae genera have a Tertiary origin in the early Oligocene. The Haberlea lineage emerged in the late Oligocene. Very comprehensive and a must to read for the professional gesneriologists is the paper “Distinct processes drive diversiﬁcation in different clades of Gesneriaceae” by Roalson and Roberts (2016, available online. With regard to sampling, it covers the subfamilies, tribes and subtribes of Gesneriaceae in a much more balanced manner than previous studies, and compares thoroughly the methods and data presented earlier. The authors demonstrate that the processes of diversiﬁcation in the Old and New World Gesneriaceae and some of their subgroups are very different, and discuss the possible reasons for the evolutionary changes. The reasons why the time data differ considerably in the various studies are probably due to the methods and sampling strategies used by the different authors (see discussion in Roalson and Roberts 2016). Age of Gesneriaceae, the subfamilies and tribes (modified and simplified after Roalson & Roberts 2016; Supplementary Appendix 6; figures rounded, those for subtribes not shown).